From the makers of UK Truck Simulator, Euro Truck Simulation and Bus Driver 2012 comes an older variant of large vehicle simulation games in Trucks & Trailers from SCSSoft. The main objective in this trucking simulator is to get goods from point "A" to point "B". The overall playability of this game isn't too long, but precision is key. The game includes 48 different trucking missions and you're basically required to get there and park in the correct position. 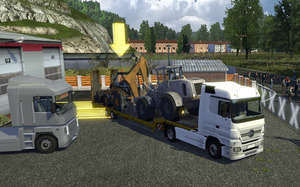 Trucks & Trailers 1.01 is a shareware program and can be used as a demo to try the software until the free trial period has ended. A full version of the program is available after the trial period ends. For security reasons, you should also check out the Trucks & Trailers download at LO4D.com which includes virus and malware tests. Additional screenshots of this application download may be available, too. Trucks Trailers has a presence on social networks.